Juan Carlos Varela of the center-right Panameñista party took office last July for a five-year term. Lacking a congressional majority, Mr. Varela has allied with the center-left PRD to push through his agenda. This includes anti-corruption measures and educational reforms, while continuing to develop the country as a regional logistics hub with the Canal expansion completed by 2016. 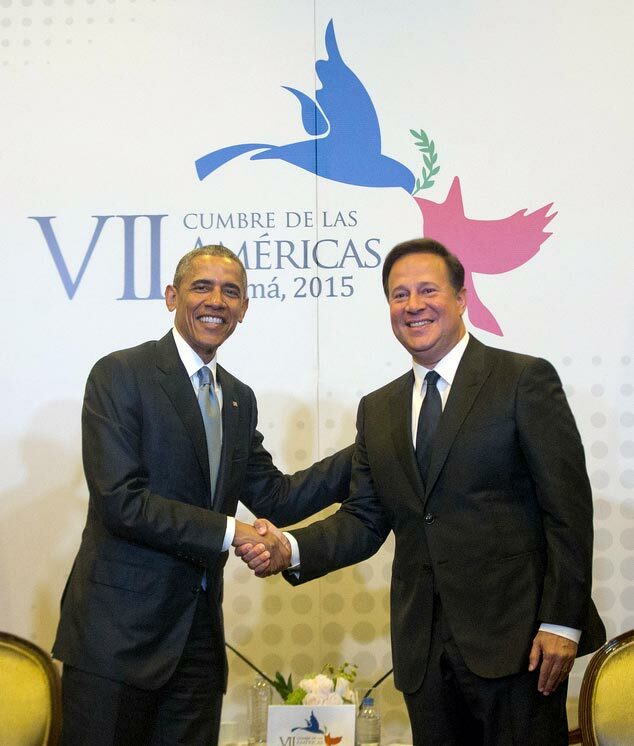 The seventh Summit of the Americas was held at Panama City, on April 2015, hosted by president Varela. The Summits are a continuing series of institutionalized gatherings bringing together the leaders of the Western Hemisphere with the goal of discussing common policy issues. This year’s theme was “Prosperity with Equity: The Challenge of Cooperation in the Americas". The fact that panama hosts such a Prestigious event reflects its status as a major player in the region. One of the most memorable moments of the summit was when President Barack Obama shook hands with Cuban President Raul Castro. The brief encounter was a historic one since it was the first in more than 50 years of estrangement. As a result of hosting the summit, Panama will see its economy grow faster in 2015 than anywhere else in the Western Hemisphere said Emanuel González-Revilla, the country’s new envoy to the United States. 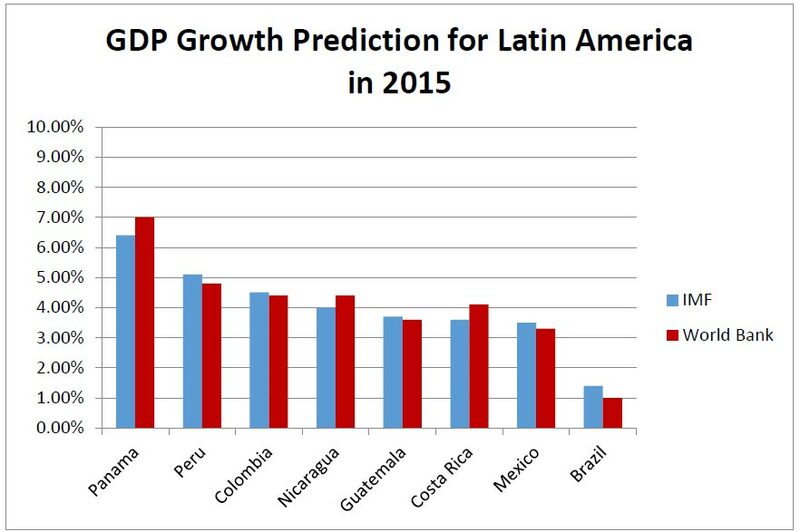 Panama’s gross domestic product is likely to expand by 7 percent next year. That’s higher than the 6 percent growth recorded in 2014 – but not as impressive as the 8.5 percent growth of 2013, however still better than all of Central America. The expansion in Q4 2014 was driven by growth in several areas of the economy, particularly in the services sector. Growth in transport, storage, and communications—which account for roughly 20% of economic output—reached 6.5% (Q3: +3.6% year-on-year). Growth in hotels and restaurants, which form the backbone of a booming tourism sector, was up from 0.6% in Q3 to 2.4% in Q4. Meanwhile, the retail sector expanded 6.4% over the previous year (Q3: +5.4% yoy). The financial services sector, which has become an important pillar of the economy, decelerated from a 5.4% expansion in Q3 to a 2.2% increase in Q4. Growth in construction and in mining and quarrying decelerated but remained in the double digits. 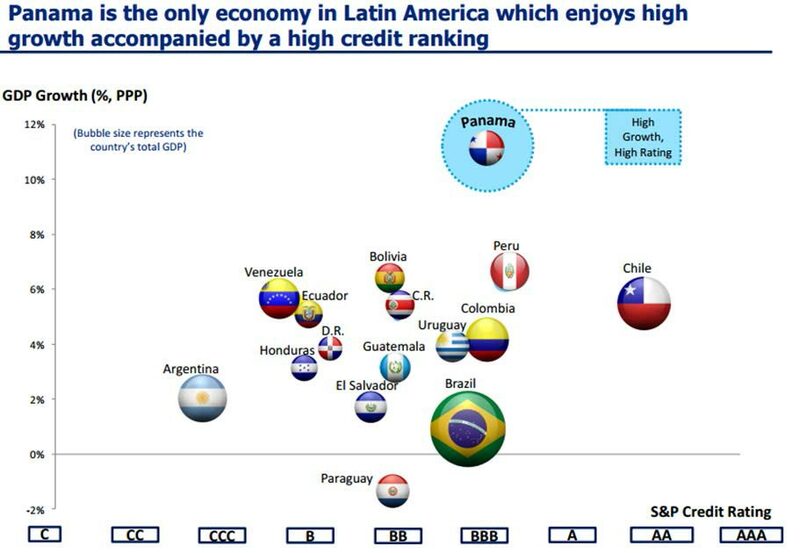 Standard & Poor’s credit rating for Panama remains at BBB. Moody’s rating for Panama sovereign debt is Baa2. Fitch’s credit rating for Panama is BBB. 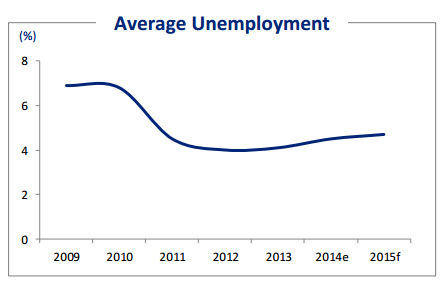 Unemployment hovers at record-low levels and well below typical estimates of the natural rate. Inflation exceeds the official midpoint targets in most of the larger economies. And persistent external current account deficits provide another indication of limited economic slack. A shifting global economic environment reverberated in Israel on March 2015, sending the dollar above four shekels for the first time in two and a half years and pushing the euro sharply lower. Over the past eight months, the U.S. dollar has strengthened dramatically against all the world's other major currencies. 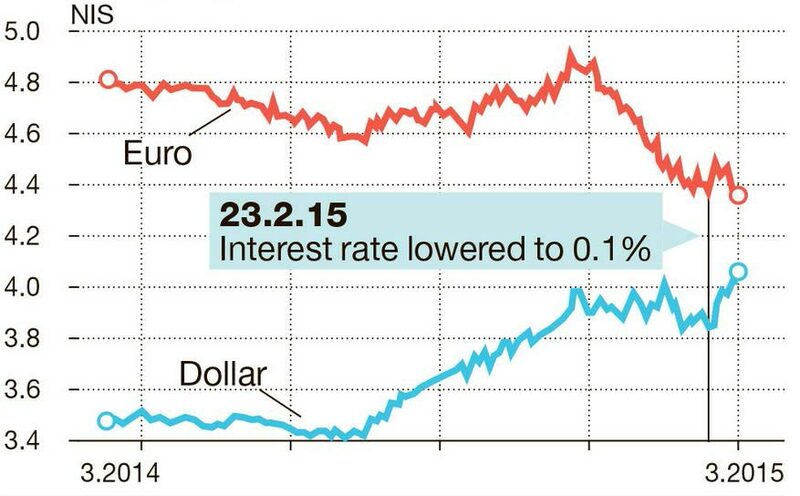 One euro is currently worth $1.05, its lowest level since 2003. This exchange rate was unthinkable only a few years ago when one euro was worth $1.37. Since Panama’s service sector provides the foundation for its dollar-based economy [the Panamanian Balboa (PAB) is pegged to the dollar; 1PAB = 1USD], all of our investments there benefits from this raising rate and strengthening of the dollar. 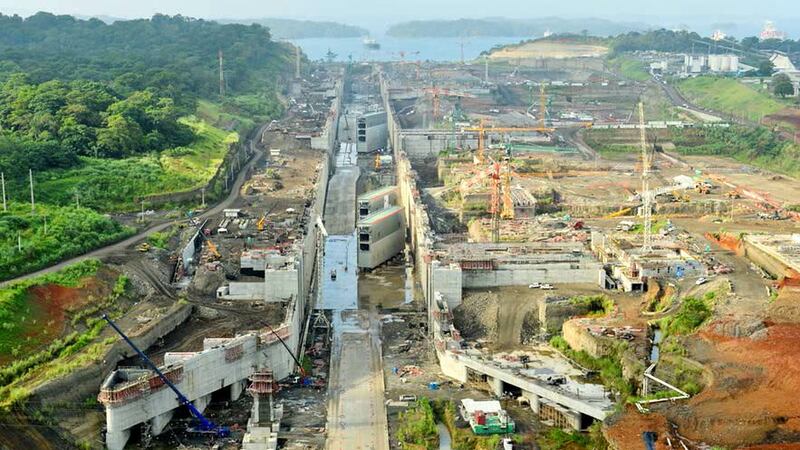 Expansion of the Panama Canal has been a major source of economic activity since the project began in 2007. Estimated at a cost of USD 5.5 billion, the construction of wider locks and deeper channels will allow for passage of larger container freight ships, help the canal remain competitive in the realm of global trade and therefore sustain toll revenues. Other large public spending infrastructure projects have also driven economic growth in recent years and solidified Panama’s standing as a major logistical hub in the region. This includes the building of a metro line in Panama City, which was inaugurated in April 2014 and is the first in Central America, as well as a new metro bus system, an improved highway network and enhancements to Tocumen International Airport. In 2014, foreign direct investment in Panama reached its highest level in history with USD 4 billion in total inflows. Exports of goods and services always have represented a major portion of Panama’s GDP. In 2014, Panama exported USD 17.5 billion worth of goods, plus an additional USD 9.8 billion in services, for a total of USD 27.3 billion, which represents almost 65% of GDP. The majority of Panama’s exported services are related either directly or indirectly to the Panama Canal and the Colon free trade zone. In 2015, panelists expect exports to rise to USD 19.9 billion. International investors continue to see Panama real estate as a good asset class to park equity due to low holding costs, relative political stability, and an economy that has shown significant gains and strong growth prospects for the foreseeable future. The government has announced that over the next five years it will be allocating $1.5 billion for the construction of 35,000 housing units for low-income sectors. Some 35,000 housing solutions built by the Government of the Republic of Panama in the next five years and 10,000 households will benefit from the Solidarity Fund Housing Program in accordance with the provisions of the Strategic Plan of Government (PEG) 2015 to 2019, having as one of its priority goals improving the quality of life of Panamanians through decent housing. In Panama, entrepreneurs are anticipating increases of between 6% and 12% in home prices in the coming months. The increase in the prices of materials such as concrete, gray cement, sand and stone, among others, is one of the factors that is pushing up the prices of homes, both those for social interest as those aimed at the middle and upper classes.